The fight against climate change began in 1992 at the Earth Summit in Rio de Janeiro that gave birth to the UN Framework Convention on Climate Change. And culminated with a global agreement in Paris last year. In terms of its scope and impact, it is probably the most far-reaching international agreement ever. THE PARIS Agreement on climate change, which India ratified on Sunday, is close to becoming a reality now. In terms of its scope and impact, it is probably the most far-reaching international agreement ever. From here on, countries would strive to make every economic activity, anywhere in the world, compliant to climate change objectives. In India, as in the rest of the world, what this will lead to is change in where we live, how we travel, what we eat or wear, and even what we do in our personal and professional spaces. But while all of these may not be visible to the common people, some certainly will. So what will change, and what could? Solar photovoltaic panels and, to a lesser extent, large wind mills will become one of the most familiar sights representing the fight against climate change. India plans to install as much as 100 GW of electricity generation capacity through solar energy by 2022, of which 40 GW would be through individual rooftop systems. India had initially announced plans for setting up 60 GW of wind energy by 2022. A number of villages are already powered solely through solar or wind energy. But decentralised production and consumption of electricity, through solar, wind, biogas or small hydro initiatives, is likely to become more prevalent as efforts are made to take electricity to 200 million people still in the dark. This shift is already underway. Bringing in greater efficiency in the way energy is produced and consumed is crucial to fulfilling one of India’s main commitments. Under the Paris Agreement, India has promised to reduce emissions intensity, or the amount of greenhouse gas emissions per unit of GDP, by 33 to 35 per cent by 2030 as compared to 2005 levels. A quarter of India’s total electricity is consumed at homes. So far, more than 3 crore households have switched over to energy efficient LED bulbs, according to government figures. More than 16.5 crore LED bulbs are in use in these houses. Electrical appliances, including air conditioners, refrigerators and television have become far more efficient. Electric cars are slowly marking their presence and battery-operated e-rickshaws have become popular in many cities. Now, stricter fuel efficiency norms will be put in place, with India advancing the implementation of Bharat VI pollution norms to 2020 instead of 2022. Besides, Metro tracks coming up in various cities across the country that will resolve, to a large extent, not just the problem of mass urban transport but also pollution caused by older forms of transport. India has promised to create an additional carbon sink — system capable of absorbing carbon dioxide (CO2) from the atmosphere — of 2.5 to 3 billion tonnes of CO2-equivalent through forest and tree cover by 2030. That is an ambitious target. Just over 24 per cent of India’s geographical area is currently under forest and tree cover, and the stated objective is to take it to 33 per cent. However, it will be difficult to rapidly expand the forest cover, especially because more forest area will be cut for developmental or industrial requirements. As a result, planting of trees would be seen as an alternative. Besides, with close to half of India’s forests of very low quality, transforming them would lead to an increase in carbon sink. In the previous Parliament session, the government managed to get the landmark CAMPA (Compensatory Afforestation Fund Management and Planning Authority) bill passed to make up for every piece of forest destroyed for any reason. Thousands of crores of rupees are available for afforestation drives through CAMPA, or Green India Mission. The government has also spoken about planting trees along the entire stretch of highways and railways. Projections show that 70 per cent of the infrastructure that India will have in 2030 is still to be built, including new cities and buildings. “Smart” and “net zero” buildings are becoming the new buzzwords, though a vast majority of new constructions are still of poor quality. 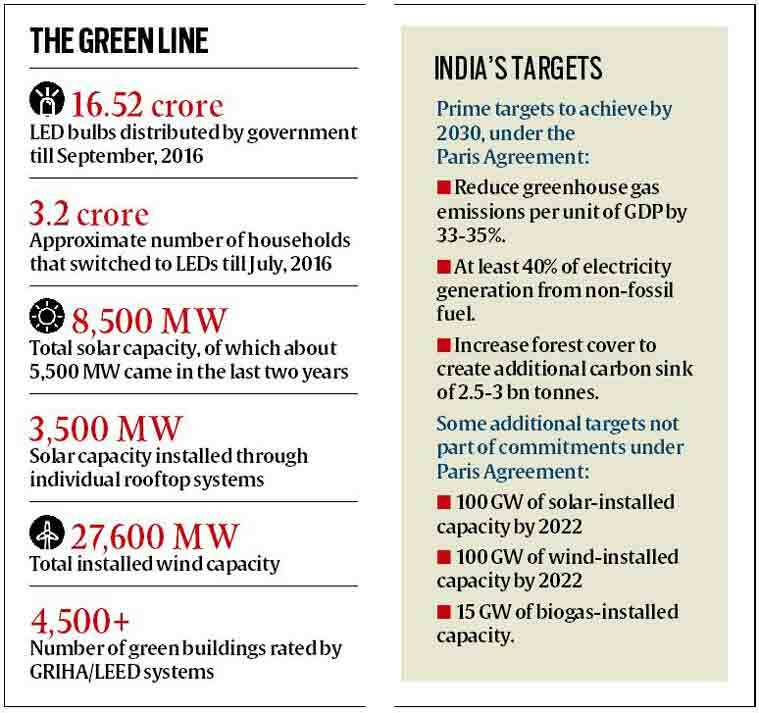 As an example, the new building of the Union Environment Ministry, which came up three years ago, was constructed to be net zero, ie., the total amount of energy used on an annual basis is roughly equal to the amount of renewable energy created on the site. What will also become more common is the rating of buildings on green parameters, with incentives or penalties on electricity or water bills. Already, the Green Rating for Integrated Habitat Assessment (GRIHA), endorsed by the Ministry of New & Renewable Energy, and Leadership in Energy and Environmental Design (LEED), a third-party certification programme, which is one of the most popular green building certification programs used worldwide are fairly well established. Climate change induces a lot of uncertainties in water availability. For a country that is already water-stressed, climate change is an additional urgent reason to reform the way in which water is managed and utilised. Some movements in this direction have already started happening. Free water is likely to be rationed in future. And water for all uses is likely to be priced. There will be no unrestricted rights over groundwater below the land one owns. And industries will be mandated to use only treated water.